Image: He basically looks exactly like Clous, or Clous looks like him. Anyway he has a darker aura, and his eyes are actually a dark blue color. personality: Victor is what most consider to be the root of all evil. Where its obvious that Clous has good intentions, Victor has none. He will do what ever it takes to get what he wants. He views the world as nothing more than a means to an end. He is also very manipulative in his thinking. Uniqueness: This is more or less a heads up: Victor has the same abilities as Clous, only his are stronger to a degree. Biography: Victor was borne in the fall about fifteen years before Clous. prior to his younger brother being borne Victor was considered the center of his clans world. Being the next in line and showing such promise for the years to come. However after his brother was borne, Victor developed a form of inferiority complex, and from that a strong hate was rooted. He lived to make his brothers life a living hell, and thrived off of the reactions he often got from others. Victor was always plotting, everything he did had a meaning. From the smallest breath to the most drastic motion, everything had always been deliberate. Dangerous was an understatement for what Victor was. He later on got a taste of power and decided that anything below him and no right to live. After Clous had involved himself with a human, Victor found more ways to add fuel to his own fire. The fact that Clous had even found love was enough, but that it was a human made it so much sweeter. He manipulated a series of events that eventually led to the death of his parents, the near banishment of his brother, the death of an entire family of hunters. And his almost successful rise to power as the head of the clan. Rp sample: Victor was sitting in a confession booth at a catholic church in Rome. He was obviously lost in thought as the words started to spill from his lips. "You could say I've committed countless atrocities against the world over my years. And that would be the truth. Thought I don't see them as such. You could say I have attempted to kill my brother and destroy all that he holds dear to, forcing him to push everything that he loves and desires. That is also true, but I do this only to make him stronger. If he fails, then he deserves death..."
Victor laughed maniacally for a few second before his fist burst through the booth and he had the cardinal by the neck. "And you could say that you are a dead man, and you would be right. But i'm sure that for you this would be bliss, going to heaven and joining your god. But by the look in your eyes could I be wrong?" Location : Caught in between the light and the darkness. Class/job: Night Class Drom President/ Night Class Rep.
....Are you making a second character? Or are you making a app for a NPC? 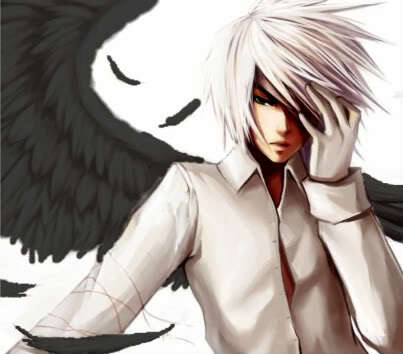 This would be my second chara, the NPC's will come later.